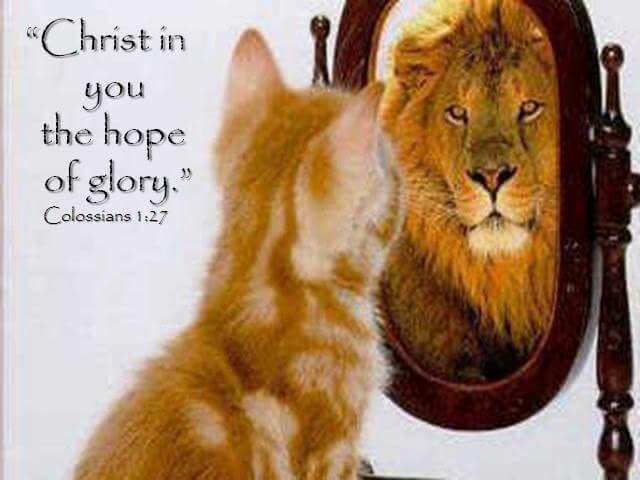 The key to victory is allowing Jesus, the Lion of Judah, to live out His life through you. Did you know that even the apostle Paul struggled with doing the right thing? Yes, this is the same Paul who wrote two-thirds of the New Testament. What Paul is describing is a “no-win” situation. That is a terrible position to be in. How many times had I struggled to do the right thing in my own power, only to fail and then condemn myself for it? In my case, my struggle was binging and overeating (gluttony). I failed too many times to count. Paul discovered that the real problem was that he was looking for power to do good in the wrong place! This is essential knowledge if you want the victory in your weight loss struggle. According to this scripture, the flesh will never want to do the right thing. That is the reason why willpower does not work ultimately. It’s like expecting a fox to guard the hen house! But Paul didn’t leave us in suspense; he gave us the answer immediately. Jesus could handle whatever happened to Him! He was victorious in every situation. In Him is love, power, strength, wisdom, grace, and truth. Scripture describes the enemy as like a roaring lion, seeking whom he may devour (see 1 Peter 5:8). For victory over him, you need a greater power – the Lion of Judah! The power of the Christian life is in allowing Jesus to live out His life through us, His disciples. He does this by the power of the Holy Spirit. Just as Jesus lived in dependency upon the Father, so we live in dependency upon Him. According to Romans 6:4-11, you were crucified with Jesus and you were buried with Him. Because of this, you are no longer a slave to sin. Because Jesus rose again, so did you. The man (or woman) who went into the grave is not the same one who comes out! Isn’t it wonderful that you can rely on Jesus’ power to live a life that honors Him, not your own effort? That old way is exhausting, not to mention the result is usually a superficial change. However, when you allow Jesus to live out His life through you, He gets all the glory for your victories, not you. How do you allow Jesus to live His life through you? This is not about you trying harder and then stacking Jesus on top of your own efforts! It is about seeing every situation through Jesus’ eyes. While you have the mind of Christ (1 Corinthians 2:16), you need to renew your mind from those old, dead ways of thinking. Through the study and practice of God’s word. You receive His wisdom and power to do the right thing by faith. This will feel weird at first. When I started with this approach, it made me uncomfortable to realize just how much I was looking to the flesh for power to do the right thing – just like Paul! But I soon realized that the flesh only wants to satisfy, justify, glorify, and even magnify itself. Whether that satisfaction was from giving in to the flesh’s desires, justification from achieving certain goals, glorification to obtain the approval of man, or magnification to feed my pride, my actions were still flesh-driven and self-centered. But as a child of God, the flesh is not the real you; your renewed spirit is the real you. Your old man was buried with Jesus, remember? I would then get power to resist by faith and carry on. I pressed into Him for strength to ride through the storm and He gave it. If you return to your old habits or find yourself looking to your flesh once again for power, say “I thank God that Christ is being formed in me,” then look to Jesus once again, obeying what He tells you to do. He is the author and finisher of your faith. Do not condemn yourself for mistakes. Situations like these show you why you need a Savior. God sent His word to heal you and deliver you from destruction. When you do this, you are contradicting God’s word. God sees the person He created you to be, even as He is working on the person you are now. He sees the end from the beginning. He will never give up on you, so you should never give up on yourself. Something glorious is being birthed in you! Do not trust your feelings. You are walking by faith, not by sight. You must settle in your heart that God’s word is true, no matter how you feel. This is very important during times of temptation and pressure. Feelings can be deceptive, especially when they are generated from lying, manipulative thoughts (those that contradict God’s word). Jesus doesn’t live in me. I have to do this. I have no choice. I’ll be dissatisfied, deprived, or miss out if I don’t do this. It’s not fair that everybody else gets to do what they want and I don’t. That is your flesh talking, not your renewed spirit. Remember, your spirit is the real you, not your flesh. So do not agree nor identify with it. When these lying thoughts come up, send Jesus to answer the door through His word! That is taking your thoughts captive to the obedience of Jesus Christ (2 Corinthians 10:5). God really used this today to get to me..The last couple day i have been feeling beat up and torn inside. I’m still new to my walk with Christ and I am on again and off again this year i decided i really wanted to stick to my walk with Christ and this time no turning back. Thank you so much for allowing God to use you. I pray this website will reach others, inspire and move them like it did me. I have been struggling with a coworker who is very difficult to deal with. I have been feeling very defeated because I let my flesh get the best of me. Instead of giving her more grace, I dealt with her the way my flesh felt. Your article has spoken volumes to me. I have asked the Lord to give me another chance. Your articles are very effective, and they deal with more areas than just weight loss. These words were so uplifting, so refreshing. I understand so much better how the Holy Spirit works in me. Thank you. Oh this really spoke to me. Thank you Kimberly! Love this article…like the fox guarding the henhouse! Great mind picture of reMINDing us not to walk in flesh. Also spoke to my heart about seeing everything through Christ’s eyes and not just stacking Christ ontop of our flesh. Another great mind picture to remind us to live in the spirit. All your words, Kimberly, God had already confirmed in my heart. I just need to hear them again and again for encouragement. I am so glad I joined tbyt because your spirit speaks to my spirit as it is the same spirit. We serve a powerful God. Thank you for keeping our eyes lifted upward. Praise God! I have allowed my flesh to rule and reign over me. Today it stops it is no longer Irene’s way but Jesus is the way and the truth. That is the only way. I realize this truth that you said that THE KEY TO VICTORY IS ALLOWING JESUS THE LAMB OF JUDAH TO LIVE OUT HIS LIFE THROUGH ME. That is so good . Last night i repented before the Lord for walking in the flesh and I surrendered to HIM completely. I just want to say thank you for all the tools you have ready for those of us who need them in the late hour and fill like there is no hope and giving up. Thank you for giving me what the Lord says. God bless you. Thank you so much for sharing Kimberly . It has encouraged me! I am new to this program. I started today. I feel inspired right now. I look forward to the journey. I now know that in the “mental” struggle. I AM NOT ALONE! Amen, Kimberly – glad that you joined us! Jesus is speaking through you, Kimberly, and the message is just what I needed to hear. Thank you for your obedience to God and for helping me grow closer to the King. Rejoice, again I say rejoice…today and always…during times of joy and times of trials. Yesterday I reacted to my Mom’s ugliness the way I would have before I became a “new woman in Christ”. Because of that reaction my daughter’s heart was broken. My mother only has a few weeks/months to live and neither her nor my daughter are saved. This spoke to my heart so loudly! I pray God will use my mess up to bring beauty from ashes for both my mom and my daughter. And help me kill the fleshly anger I still hold in my heart for my mom. I’m praising God for you, Kimberly. Thank you for reposting this message today. It’s Easter Sunday and our pastor gave a very similar message. I tried for years to do this in my own power and felt very defeated and heard all the lies from the enemy. I love your analogy to send Jesus to the door. Thankfully the Lord has been teaching me how to turn to Him instead and fully trusting Him. I even realized I was missing a part of the verse that says to first “Submit to God” then in His power I can resist the devil and flee. I thank God for you and this ministry!!! The emails help me so much to “remember”! !